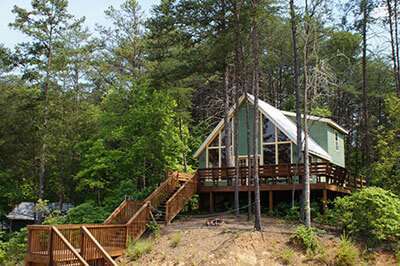 Do you need lodging for your group? Our new log cabin style bunkhouse has 4 rooms that can house 44 people in individual beds upstairs and downstairs. We provide mattresses but you have to bring your pillow, sleeping bag, and towels. There is a small kitchen with a refrigerator and a microwave (no stove, sorry). Don’t worry about the summer heat. 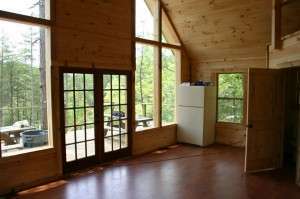 The lodge has air conditioning! 2 small bathrooms add to your convenience (showers are just down the hill in our main bathhouse). 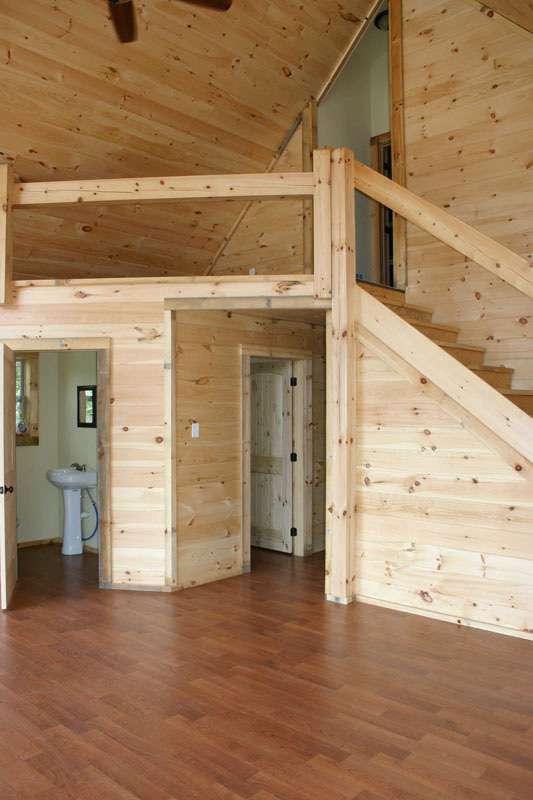 The big common room and large deck make great hangout spaces, meeting room or a game playing area. Also, there is a dedicated fire ring for your group behind in the woods. 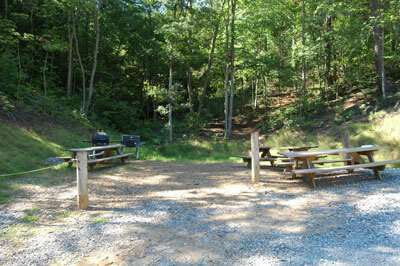 Picnic tables and grills are also provided on the large deck. 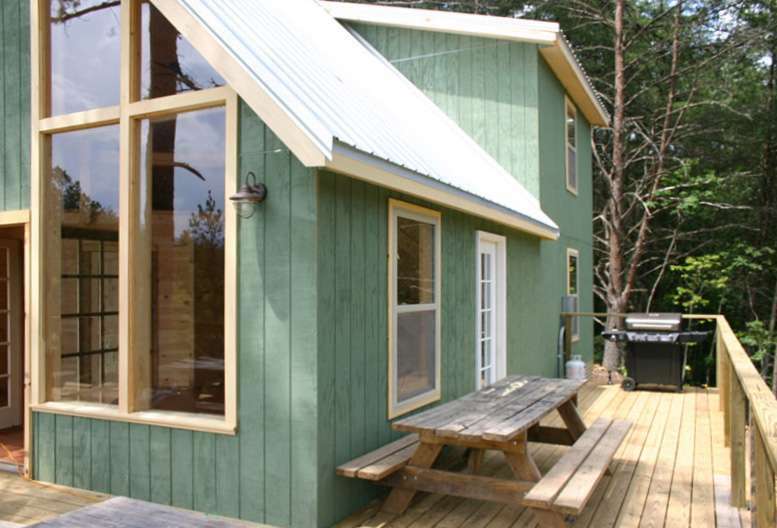 Our rustic Small Lodge has 2 bunk style rooms that can house 16 people in individual beds. We provide mattresses but you have to bring your pillow, sleeping bag, and towels. 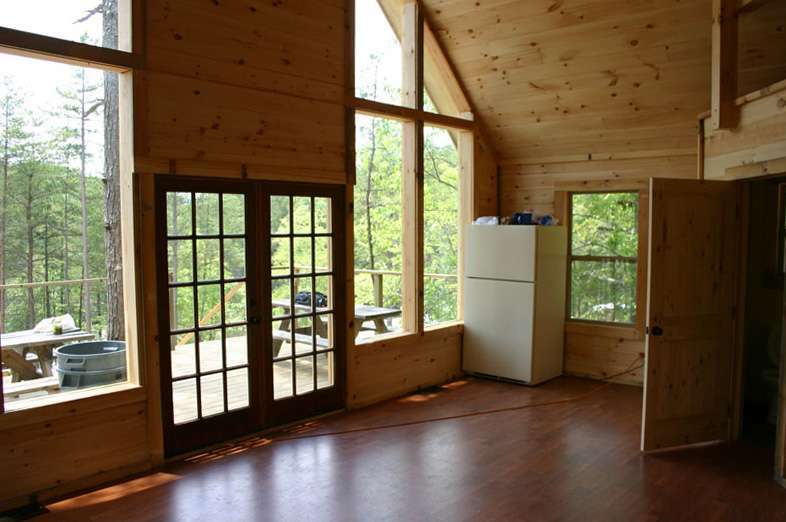 There is a small kitchen with a refrigerator, sink, and a microwave (no stove, sorry). 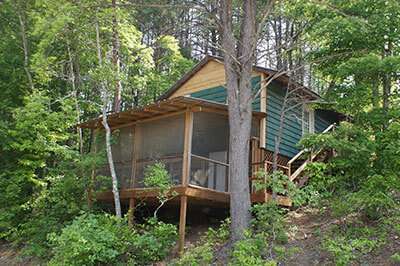 Like all of our lodging, the small lodge has air conditioning also! 2 small bathrooms add to your convenience (showers are just down the hill in our main bathhouse). 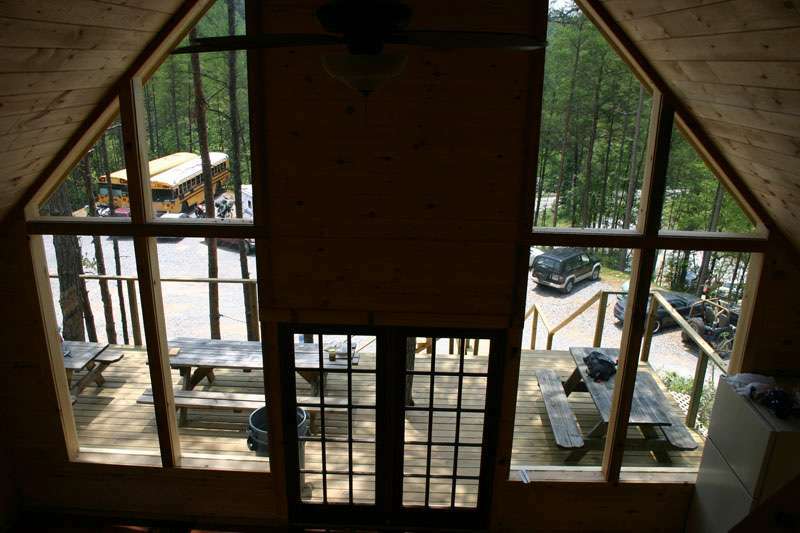 The large screened in side porch makes great hangout spaces, meeting room or a game playing area. 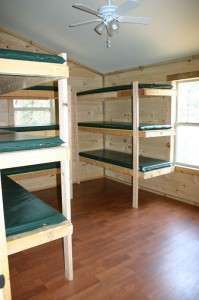 We have a few small campsites available if your group is into “roughing it”. We have 2 sites that hold 3 or 4 small tents. Remember to bring firewood (which also can be purchased locally), water containers, garbage bags (keeping a few extras for wet clothes is a good idea), grills (small portable propane grills are great), lanterns or flashlights, matches, towels, a ground cloth (tarp), sleeping bags, tents, and folding chairs. We’re planning a large campground for next year. If you need more room than we have available this year, the US Forest Services Thunder Rock Campground is only 5 minutes from the outpost. 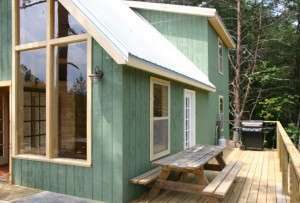 The sites are large, include a picnic table and fire pit. 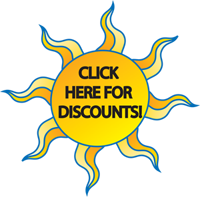 The cost at Thunder Rock is $12.00/site. 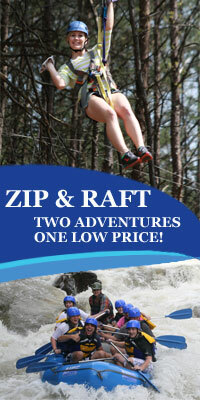 Camping Rates: $5.00/person/night No reservations these sites are first come first serve. 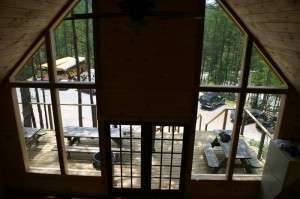 Large Lodge view to the outside through the glass front. 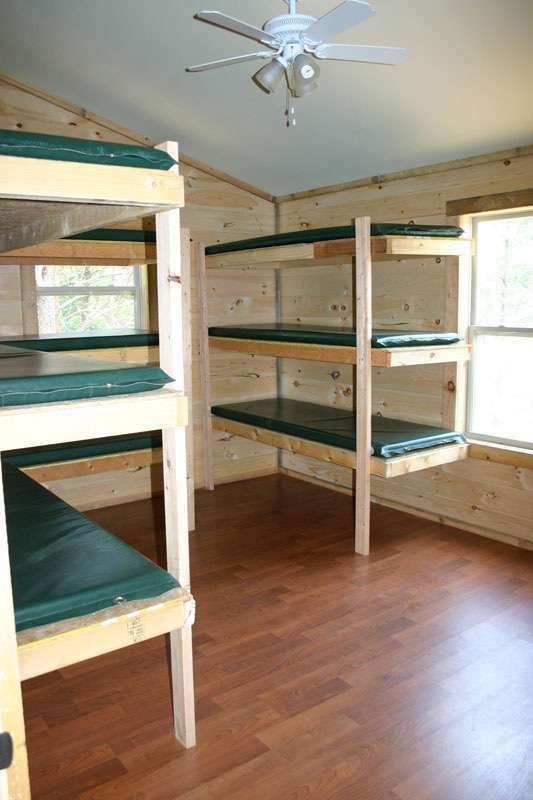 A bunk room in Raft One’s Large Lodge. Raft One’s Large Lodge main room on the first floor. Raft One’s Large Lodge outside deck. Raft One’s Large Lodge main room and bathrooms.